Opening the door to an online user experience that responds to the demands of advertising in the information age. Advertise in a new online magazine format and connect with your customers as never before. Eureka Springs Visitor premiered its online version of its tabloid circular in the 2018 tourist season. 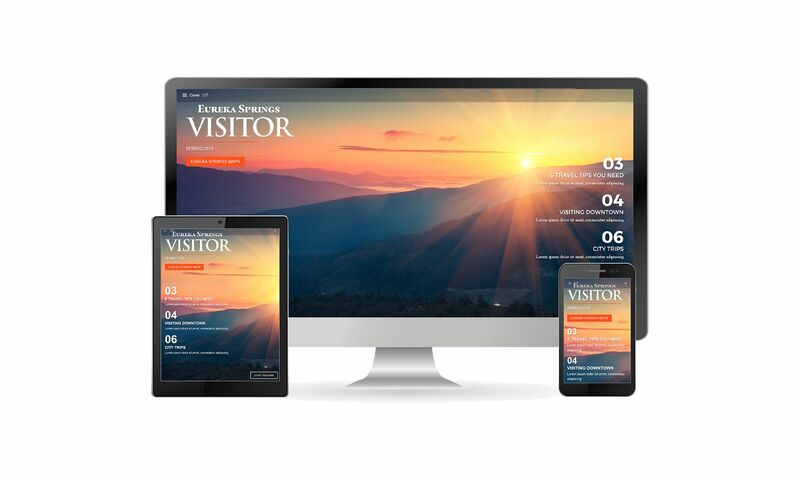 From the ground up the Visitor staff has built an online following through social media engagements and campaigns, reaching an average of 15,000 social media users each month of publication. We are excited to open our online publication up to new advertising opportunities. Creating speciaty ad listings for our restaurants. Our calendar of events offers timely opportunity to get your advertising message to viewers. Place your ad directly inview within the monthly calendar or opt for prime placement of video at the top bar above the calendar. Both spots are prime locations to deliver a timely message to future and current visitior of Eureka Springs. Advertise in content using video or a custom interactive ad.